VITAMIN A-Z Antioxidant Formula is a complete set of all the essential vitamins, minerals, trace elements, and the strongest antioxidant derived from green tea extract and grape seed oil. Vitamins, minerals and trace elements are acting as co-factors of enzymes and proteins involved in all physiological processes in the body m al. : in the process of absorption, digestion, transport of nutrients and oxygen to the cells and the metabolism of proteins, fats, carbohydrates, nucleic acids, in signal transduction in the cell membrane transport in the detoxification of the body defense against pathogens. Physical exercise, stress, illness, chronic inflammation, smoking, poor nutrition, radiation and ultraviolet radiation and environmental pollution are the main factors which increase oxidative stress in the body, which accelerates the aging of cells, including skin cells and causes or worsens the symptoms of degenerative diseases. Natural antioxidants - natural help in the fight against "free radicals"
VITAMIN A-Z Antioxidant Formula provides the body with a complex of bioflavonoids extracted from green tea extract and grape seed oil , which together carotenoids and a large dose of antioxidant vitamins E and C , and quenched sweeps "free radicals", inhibits lipid oxidation, so anti-inflammatory, anti-allergic, antioedematous, exudative, revitalizing, strengthening blood vessels and immunostimulatory. Used in the preparation of piperine , derived from black pepper extract increases the absorption of nutrients, vitamins and minerals, adding to the healthiness of the supplement. 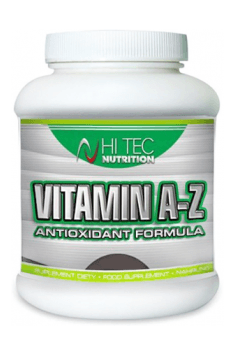 VITAMIN AZ Antioxidant Formula is a product for all who care about health and beauty, especially for athletes who have a need for vitamins, minerals, trace elements and antioxidants is particularly high. If you're working at the computer a long time and you have tired eyes, use grape seed extract, which effectively regenerate the retina than the commonly used extract of blueberries. Studies have shown that grape seed extract faster or more with venous insufficiency compared with diosmin - flavonoid commonly used in the treatment of venous diseases. If during exercise you burn more calories from fat, use vitamin C.
If you want the inside to protect your skin from the harmful effects of ultraviolet radiation, use of L-tyrosine, grape seed extract, green tea extract, vitamin C and E, turmeric, carotene (carrots, pumpkins), lutein and zeaxanthin (broccoli, blikopen (tomatoes ), spinach, kale, Italian cabbage), squalane (olive oil, aramantusa), fatty acids Omega-3 (EPA and DHA). One portion (2 tablets) once daily with a meal. The dose and duration of application should be adequate to deficiencies in the diet. A unique preparation that effectively enhances mind acuity. Ideal for students and the elderly.